When Paul Sartin finishes his current tour with Bellowhead, he’ll be back on the road playing small clubs with Paul Hutchinson. The duo have worked together as Belshazzar’s Feast for nearly 20 years, and developed a style that mixes their celebrated sense of humour with some very fine musicianship. This is a Christmas-themed album, but that shouldn’t put you off. More than half of the tracks are instrumentals, with Sartin’s oboe, cor anglais and violin matched against Hutchinson’s accordion on elegant, stately tunes scuh as Coventry Tango or the sturdy, hypnotic Mr Marsden’s Maggot. They make the traditional songs their own, too, with Sartin’s sturdy vocal work joined by choral backing on the elegant Sussex Carol and The Shepherd’s Song, an 18th-century Gloucestershire story of shepherds in a pub. There’s also a comedy treatment of Silent Night – dedicated to John Cage. 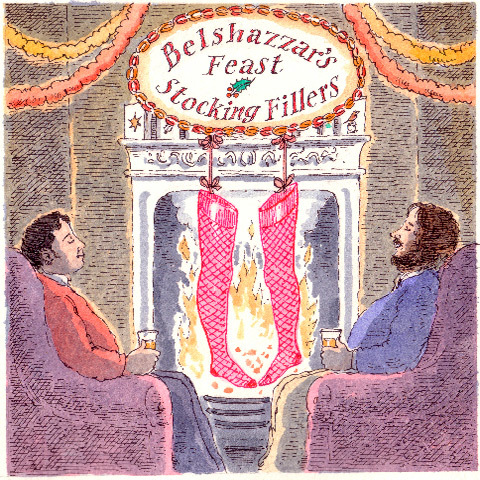 Christmas albums come in all sorts of musical shapes and sizes: this one is not exclusively seasonal! Perhaps that’s part of this duo’s continuing humorous take on traditional music. Keeping to the theme, though, there is the much-loved ‘Sussex Carol’ (noted by Ralph Vaughan Williams from Mrs Verrall) – with the Andover Museum Loft Singers on chorus – and ‘Joseph and Mary’ (again, noted by RVW, with Ella Leather, in Hereford – shire). ‘Coventry Tango’ takes ‘The Coventry Carol’ tune as its starting point! And there’s the bonus track – ‘Silent Night’ – dedicated to John Cage: the humour pops up everywhere, although the track only lasts 2 minutes 43 seconds, not 4 minutes 33 seconds, which would have completed the joke! It is in the instrumental tracks that the musical expertise of these two Pauls really shines. The CD notes (as hilarious as their spoken introductions at concerts and musical jokes) explain that ‘Parson’s Farewell’ here is their third recording of the tune: another cleverly arranged version of this Playford favourite. There is more from The Dancing Master in ‘Playford’s Christmas Ball’: ‘Nonsuch’ (with a chorus of the Russian song ‘Kalinka’) and ‘Jamaica’ (with an added phrase from Harry Belafonte’s ‘The Banana Boat Song’). As with the other tracks, the subtlety of the musical jokes and the excellent musicianship mean that there is something new to hear every time you listen to the CD. The CD includes two of Paul Hutchinson’s excellent compositions: ‘Bumpers’ and ‘Mr Marsden’s Maggot’, though he (and perhaps Paul Sartin as well) could surely claim ownership of the two arrangements of ‘Green Sleeves’. Paul’s tune, ‘Will’s Jig’ follows ‘The Shepherd’s Song’. Like their last seasonal offering (Frost Bites in 2009), Stocking Fillers will surely, and deservedly, have a ready sale on their annual Christmas concert tour and, indeed, throughout the year.